There’s plenty to play over Thanksgiving break with this Store update’s new releases – PlayStation All-Stars Battle Royale is out on both PS3 and PS Vita, while Disney’s Epic Mickey 2, a special edition of Hitman Absolution and Family Guy: Back to the Multiverse are on PS3. Joining them are previously released titles including Kingdoms of Amalur: Reckoning, Tom Clancy’s EndWar, F1 Race Stars and the DOOM Classic Collection. If you’re a PlayStation Plus member you can now download a ton of content for your PS Vita. With the membership spanning both PS3 and PS Vita now, you can look forward to 18 free games a month — not to mention the other Plus benefits. Besides all the Plus freebies, PS Vita owners can nab Persona 4: Golden, Sine Mora (also available on PSN), Jet Set Radio (though if you’re a Plus member, it’s free!) and Elminage Original (also for PSP). There’s also some add-on content out today you might be interested in. Been enjoying Telltale’s The Walking Dead Episodes? Then you’ll be happy to hear that the final chapter, No Time Left, is out today. Also, Borderlands 2 fans can download Mr. Torgue’s Campaign of Carnage. Princess Swimsuit 1 ($2.99) – Download the ‘Princess Swimsuit Set 1’ and unlock princess beachware that adds support skills! Dress up royal princesses such as princess Apricot, Sakura, Amabile, and Verde! Princess Swimsuit 2 ($2.99) – Download the ‘Princess Swimsuit Set 2’ and unlock princess beachware that adds support skills! Dress up royal princesses such as princess Shizuka, Kokomo, Iris, and Corina! Deus Ex ‘Zenith’ Handgun ($0.99) – The Zenith pistol was the handgun of choice for Adam Jensen in Deus Ex: Human Revolution and can now be used by Agent 47 in Hitman Absolution. The 10mm compact pistol can be equipped with a Stenier-Bisley silencer to make sure that Agent 47’s missions can be completed like a Silent Assassin. The Zenith handgun is also available as part of the Suit and Gun Collection. Not too late considering this is most massive update ever! Thanks, Grace & team. 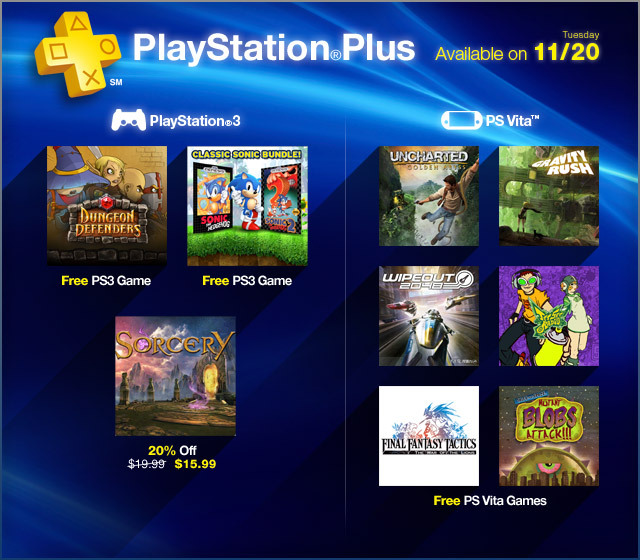 PS Plus on Vita! Giggity giggity giggity, Goo!!! Alright! Thank you! Such an amazing Playstation Plus update. Please pass along to the decision makers that this is an EXCELLENT update. With the PS Plus Vita IGC Collection and the Black Friday price drop for Vita bundles, I will absolutely be picking up a system this weekend. Quick question for all of us soon-to-be new Vita owners–how can we tell if a PSP game is compatible with Vita on the network? Thanks in advance! This just seems extremely odd, and I’d really like to download them and play them on my Vita, but I can’t! And I know I’m not the only one from the comments on store updates the past few months. Any help or update, please? Hi, we’d love to have the games… it’s really up to Square to release them in our territory. Where are the costumes for all-stars for those who preordered the digital version. Doom Classic Complete offers some serious value to any who can get down with old-school shooters. Practically everything is there, including Final Doom and it’s multiplayer levels! Please check into getting those put back up for purchase. We are aware and are hoping to have that fixed soon. This is the third week I have been telling you, the PlayStation Store Staff, that the Gran Turismo 5 DLC packs “Twin Ring Motegi Pack (2 tracks, 3 layouts)” and “Speed Test Course Pack” are not available on the US PlayStation Store because of the glitch store re-design. I have contacted many people and they say “Oh yeah we will tell the Store team to fix it” but when I post each Store update it always goes ignored. Fix this issue already, I have been more than patient and ignored enough. Looks like a big update. While it’s not pertaining to this update but more the store in general, is there any work being done on the problem with games not showing up in any category or in the wrong categories, like Bioshock 2 in RPG category for instance? I know it’s probably low priority and I have no problems using the search but I’m just more curious than anything else. Thanks, we are aware and are looking into making this more clear for everyone. Any fix yet for previously purchased content that is not showing up as purchased (mainly PS+ games, but also the Costume Quest bundle)? Thanks. Is the content appearing in your DL list? We’ll continue to look into this. Great update. Now if you could fix the navigation disaster that is the PSN store I may consider buying something. And just like that, my 32GB Vita storage card is full. Kidding. Send a link of this page to Nintendo. Teach them how to run a store. Ya done good, Sony. A million thanks for PS+ value. I keep getting “An Error has occurred. (NP-224-0) when trying to download a PS+ game on my Vita. Anyone else getting this as well? Is having to download a new PlayStation Store update going to be like a regular thing every week or is it just bugfixes? It was just a patch… won’t happen every week. So…many…games. Vita can’t hold them all. I guess I’ll spend $100 to buy a new Vita memory ca-…………. This is a massive update. I bought Hitman from Gamestop, but the digital copy is far better for the same price. I’ve been having a blast with Playstation All Stars, I will now put it down to play Sine Mora. I bought PS All Stars at retail and used the Pre-Order Code and all I got was the PS3 Versions of the costumes. Where are the PS Vita Pre-order costumes? Regarding the “Spend $60 or more, get $10 back, can I use the $20 voucher in my wallet to count as part of the $60 spent? Nice update today! Can we get Unity3D ported to Vita Mobile? Finally, PS+ 4 Vita, yay! It’s gonna be a busy night :) And Dungeon Defenders seems neat though I would have prefer a good turn-based JRPG but Tactics on Vita will do. Any chance Uncharted and Gravity Rush DLC’s price got a cut off? That would be awesome for us who bought these games before. Great Update!! Been wanting to play gravity rush! Please add Demon’s Souls and dark souls to psn! also good job on the price drops on those games there are some more out there that need lowered as well! If we own Jet Set Radio already, will it work on the Vita now?? still disappointed Sony couldn’t be bothered to round up a real sale to rival black friday deals at other places. At least got Walking Dead ep. 5. Already have Persona 4 and All Stars on disk. This update is weak….haha joking! I may be buying a Vita after all. My friend moves into her place. Gamestop Black Friday…. There are some issues with the PSN Store on the PS3 end..
PlayStation Plus/ New Arrivals / B L A N K ?! Are either Playstation Allstars or Sine Mora Corss-Buy titles? PS All Stars is if you buy the PS3 version, you get the Vita version. Sine Mora is not a cross-buy title. Can u guys please please please tell us if far cry 3 could be a digital download on the psn store? that way ill be able to know whether or not to save my money for that than something else. Please make it happen! I feel sorry for people who wasted money on those vita games. I knew their lineup of vita games was small enough that I’d end up getting them free when PS Plus came out for Vita. I didn’t think they’d release 6 of them at once though. They REALLY wanna sell the Vita for Christmas. What they really need to do is drop the price for the memory cards. $100 for 32gb?! I can buy a 1000gb hardrive for my PC with $100… cmon Sony. Looking forward to what else is coming for the rest of the year. Job well done. Where is Guilty Gear ACP??? When is going to be in PSN??? Any Black Friday/Cyber Monday sales for the PlayStation Store? one complain here; i hate that now everyone can see when im shopping on the store. i dont want peoples see that im on the store. Someone can give me a little help? Not sure if i get the PlayStation All-Stars Battle Royale for my PS3 (And got the vita version) for 59,99 or only the Vita Version for 39,99. Today i use my Vita more than my ps3, so my question is, the PSVita Version are the same game like the ps3? Because if it is different, i agree that i need to get the ps3, but if is the same hole game, i will be satisfied with the vita version. Please someone? I say buy the PS3 version and enjoy the game on both platforms… but hey, that’s just me. Terrific update! Can’t wait to try PS All-Stars and Walking Dead.